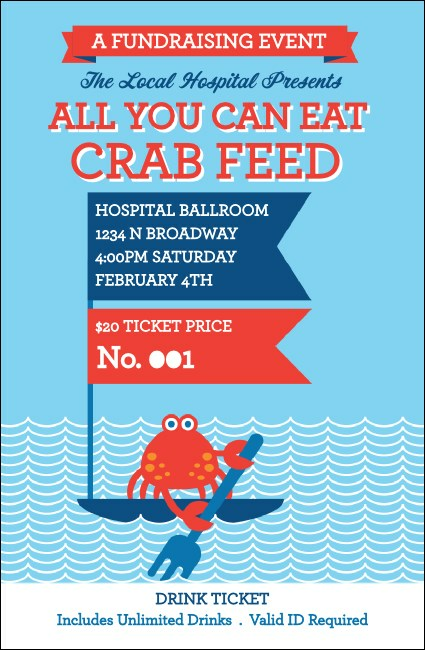 Salute the sea when you hand your guests the Crab Feed Drink Ticket! This template features a lone cartoon crab piloting a double-flagged sail boat among uniform waves and using a very handy fork as an oar. The bright red, white and blue color scheme helps 12 lines of easy-to-edit text get everyone's attention. Toast to the right drink ticket with TicketPrinting.com!